How to stabilize the economy of Ukraine and how to move towards a sustainable reform and growth path? These questions were at the very centre of a high-level discussion organized by Bertelsmann Stiftung on 18 June in Kiev. 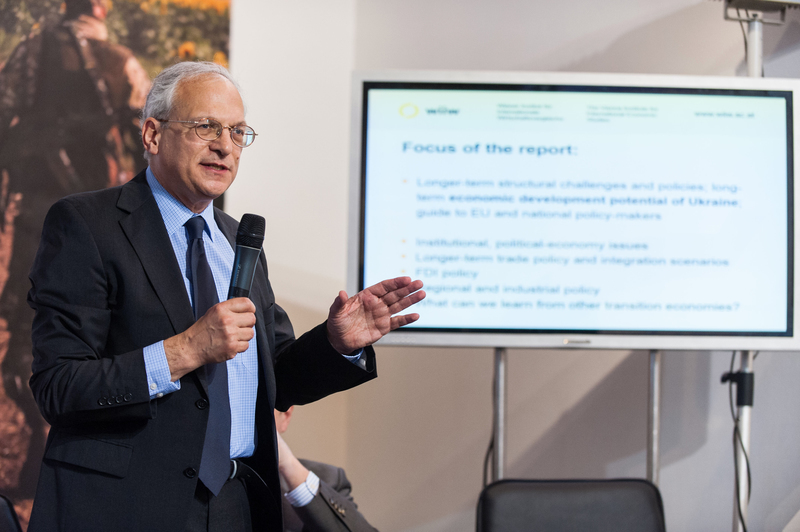 wiiw Scientific Director Michael Landesmann and former Deputy Director Peter Havlik presented the recent wiiw study “How to stabilize the economy of Ukraine”, which was undertaken on behalf of the Bertelsmann Stiftung and United Europe. Develop a long-term modernization strategy, including an industrial policy to improve competitiveness and restructure sectors such as machinery, railway, chemicals, food processing and nuclear industry. The difficult process of regional and industrial restructuring of economic activity in the wake of the current conflict will require substantial international support. Put together a coherent package to attract foreign direct investment by revitalising the FDI agency InvestUkraine and by setting up business and industrial parks with clear ownership rights, good infrastructure as well as the support of the competent local/regional administration. Encourage cross-border production linkages with Central European economies. Financial and material assistance should be rigidly tied to the progress in dismantling the oligarchic interests, the implementation of institutional reforms, and the severance of relationships between business and politics. 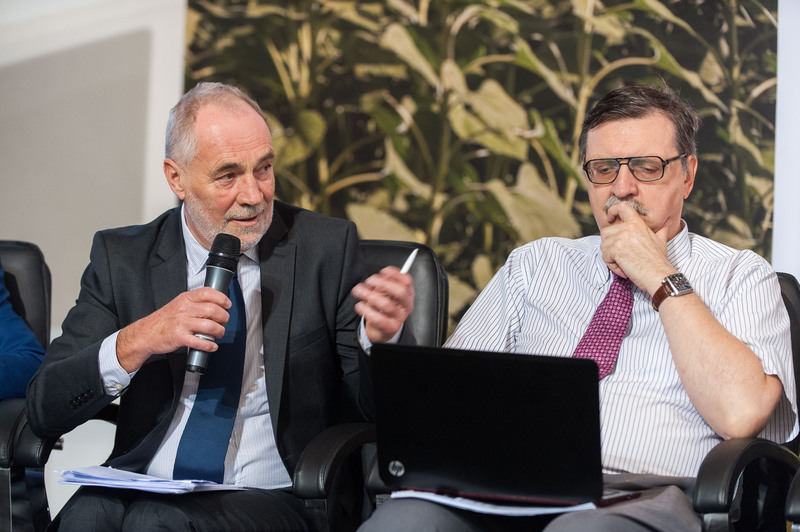 Difficult trade policy negotiations should aim as much as possible to maintaining free-market access to both the EU and the CISFTA, as currently arranged. Last but not least, a sensitive approach towards the social impact of the stabilization policies currently implemented in Ukraine as part of the IMF-led program is needed. The impact of such policies on ordinary Ukrainian citizens should be carefully considered so as not to erode the necessary broader reform support. 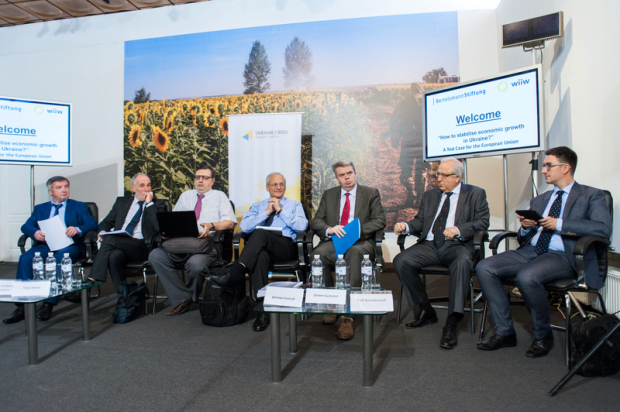 The wiiw recommendations were discussed with Sevki Acuner, the representative of the EBRD in Kyiv and four eminent Ukrainian economists, namely Dmytro Sologub, since March 2015 Deputy Governor of the Ukrainian National Bank, Vasyl Yurchyshyn, Head of the economic department of the Razumkov Centre, Igor Burakovsky, President of the Board of the Institute for Economic Research and Policy Consulting, and Hlib Vyshlinsky, Executive Director of the newly established Centre for Economic Strategy in Kyiv.